Real estate for permanent living or for frequent use has special requirements. Spanish real estate which is perfect for summer holidays is not that attractive for permanent living. The most important requirements are developed infrastructure, wealth surrounding, good traffic and a high level of cultural life. Real estate for permanent living or for frequent use has to meet special requirements. Spanish real estate that is perfect for spending summer holidays is not always attractive for permanent living. The most important requirements are developed infrastructure, convenient surroundings, good transport connection and a high level of cultural life. Among all cities in Spain the most demanded real estate is definitely found in Barcelona. The capital of Catalonia is one of the top ten most convenient cities for living in the world. The commodities available to Barcelona residents is an important factor in buying real estate in the city. A life rich in cultural and sports, convenient traffic, prestigious educational and medical institutes, and the best Mediterranean restaurants are only few of the great advantages Barcelona residents enjoy daily. Real estate properties in the maritime districts of Barcelona (e.g. Diagonal Mar or Poble Nou) are some of the most demanded. New houses are built based off of the best American designs and have big terraces and great sea views. The living communities have swimming pools, gyms and tennis courts. The famous sandy beaches of Barcelona are only 100 meters away and you can reach the center of the city in 15-20 min by private or public transport. 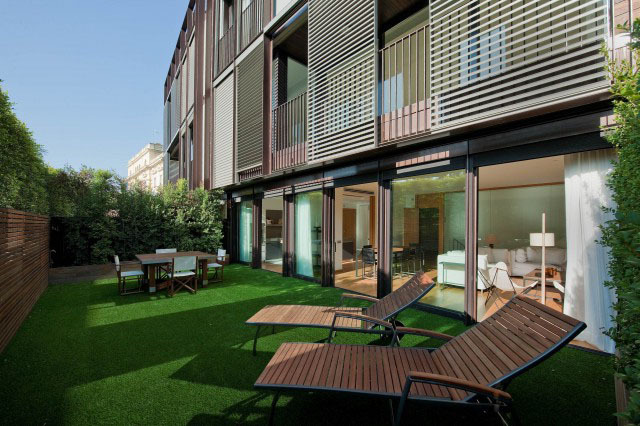 To those who are used to living in a more traditional city atmosphere, we can recommend real estate in the higher districts of Barcelona (Zona Alta) where the most luxurious and aristocratic apartments are located. Pedralbes is the only district of Barcelona built up by private houses with big green plots. Real estate prices in Barcelona are quite high, however, apartment or house ownership in Barcelona has a lot of advantages. High liquidity will make you feel safe about investment conservation, and life expenses in Spain are way lower than in its neighboring countries of France and Italy. Real estate ownership taxes, expenses for utilities, food and transport are much more reasonable in Spain. Another option - leasing a purchased real estate Barcelona, will provide a stable annual income and the maximum profitability rent. Families who prefer living in a villa away from city noise should consider purchasing real estate in Barcelona suburbs. The capital of Catalonia can be reached only in 20-30 minutes which makes it possible to visit Barcelona on daily bases. Costa Garraf lies 14 km to the south of Barcelona, just past the international airport, El Prat. The closet cities, Gavamar and Castelldefels, are known as beloved neighborhoods amongst Barcelona's high class. Several of the FC Barcelona players, including Lionel Messi, live there. The main advantage of Costa Garraf is a well-organized, wide, 8-kilometer- long sandy beach, with beachside walking, jogging and cycling paths .Costa Garraf is the only city among Barcelona suburbs where the beach is not divided from the residential area with a railroad. There are communities of houses and apartments, districts covered with pine forests, and villas located right on the coast. The coast is flat which provides an opportunity to utilize the whole territory and to maintain maximum privacy. Coasta Garraf is the most developed suburb of Barcelona.The majority of buildings are quite old and there are very few areas available for new construction. The surface area of plots varies from 800 to 3000 meters. There are prestigious settlements with gorgeous mountain and sea views located on the hills two - four kilometers away from the seaside. A lot of people prefer to live in mountain settlements since the air is drier than on the seaside. Real estate prices in Costa Garraf are similar to those Barcelona, though sometimes higher. The most in-demand properties are the villas with large plots located on the shoreline, townhouses close to the beach and big villas in the foothills. Costa Garraf is considered to be one of the most prestigious cities in Spain in terms of comfort of living. Costa Maresme is located to the north from Barcelona in the direction of France where a lot of wealthy Catalans live. It is very popular among real estate investors due to its proximity to the capital of Catalonia. Prestigious real estate in Maresme is concentrated in settlements located next to the mountains, 2-5 kilometers from the sea. Due to this distance, the air is not as humid and the climate is mild throughout the whole year. The Maresme Mountains are covered with Mediterranean pines. The large forest areas are preserved and any kind of construction is forbidden. Thanks to this, many properties benefit with having beautiful pine forest views. Costa Maresme is a good place for permanent living due to its developed infrastructure and lack of tourist traffic. In this zone there are a lot of great restaurants placed in antique buildings. For sport lovers, there are several yacht, golf and tennis clubs, sport grounds and swimming pools. Also, there are prestigious, private schools in Maresme. Wide sandy beaches are located only a few minutes away from the building settlements and you can get to Barcelona by highway in 20-30 minutes. Thanks to the availability of free land in Maresme, it has the highest number of new high quality housing offers among Barcelona suburbs. An important feature of some homes in this zone are big plots ranging from 2,000-3,000 square meters. Real estate prices in Maresme are reasonable and its price to quality ratio makes it one of the best places for living in Spain.